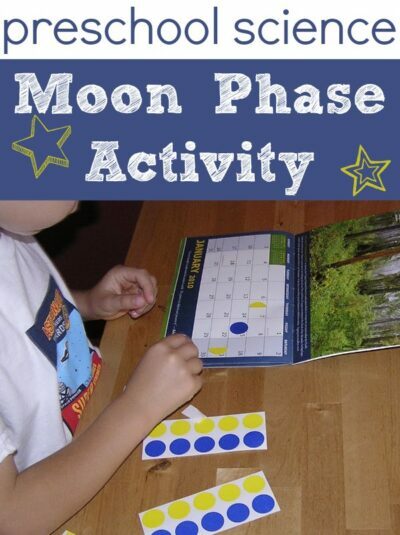 This moon phase calendar activity was a super easy project designed to reinforce the concept that the phases of the moon run on a monthly cycle. It’s perfect for preschoolers! Also, its a good way to use all those charity calendars! 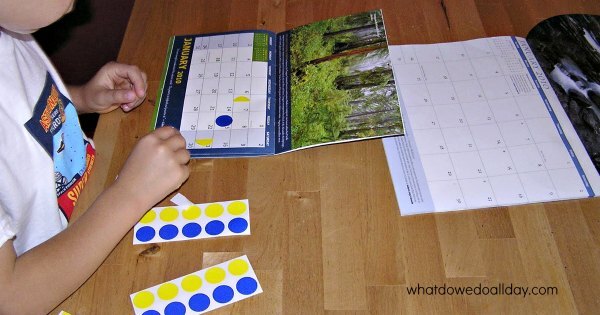 Referring to one calendar already marked with the moon phases, Kiddo used office supply stickers to identify on an unmarked calendar which days in the coming months the moon will be new, waxing half, full and waning half. We used blue circles for a new moon and yellow stickers in whole and half sizes for the full, waxing and waning phases. Easy, fun and kept him occupied for a time, what more could I want? Be sure to check out all 5 of our Moon Activities for Kids or read some moon picture books. Great idea!! We love using office supplies for fun, educational activities like this and I know Emily would love this! It's pretty much the perfect activity! Aren't you the clever one! So did you have him cut the circles for the quarter and half moon??? Lisa: I cut them ahead of time, but you are right I should have had him cut them! oops.